Now, this is not my all time favourite Steptoe episode. But I would be lying if I said it didn't rank highly in my books. Even though not being around when this was broadcast (I'm only 16! 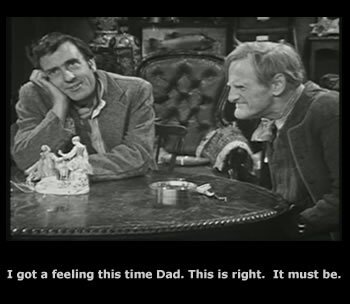 ), you can see that this episode has trapped the era within it's black and white capsule (not saying that the comedy is outdated, Steptoe will live forever! Just the Views and characters conveyed within). An example of this is one of Albert's best lines ever, and I do not imagine this being allowed on TV in any form other than a repeat of this episode - "You get past Hammersmith and your stuffed, not an englishman in sight, apart from the poor devils who work for them, you go anyway in London today and ask for directions, and all you get is Me no speaky the English - me wog!" I crack up whenever I hear this! Another thing being the Antique dealer - I've seen him somewhere else cropping up in 60's TV. Also, a cracking performance on behalf of Harry H. Corbett - "so if you woul d kindly purport to have a butchers at it"! This is an episode dear to me. Harold has found a genuine 'piece' on the round. He want's 10.000% profit, Albert has other ideas.